For the second time this summer, Oregon health officials are trying to limit a potential outbreak. 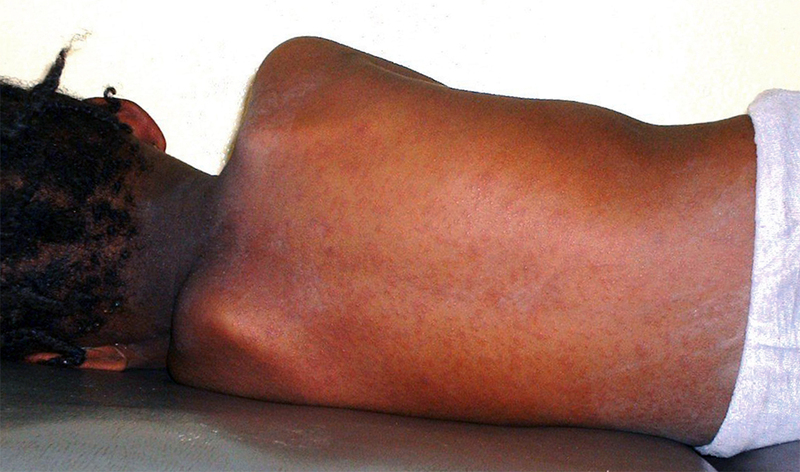 Patients who contract measles, a highly contagious disease, develop a skin rash. Oregon health officials announced a new measles threat in the Portland area on Saturday. A news release said a person infected with measles recently left Portland after spending a week in the area. The visit came about a month after another individual with measles was in the metro area, leading to a few other cases. This latest case involved an individual who arrived at Portland International Airport on July 30 and left last Tuesday. During their visit, they were in Portland and Beaverton. The infected person was not identified. Oregon health officials are trying to notify those who may have been exposed. Measles is highly contagious and potentially serious. One to two people of every thousand infected end up dying and about one in four have to be hospitalized. It can take up to two weeks for symptoms to appear. They include fever, a rash, cough and swollen eyes. Complications include an ear infection, lung infection or diarrhea. Patients can also suffer encephalitis, a swollen brain which can lead to death. A highly effective vaccine has curtailed the disease in the United States but it is still common in other parts of the world, including in Europe, Asia, the Pacific and Africa. Fully vaccinated adults are considered protected but infants are vulnerable. The first shot is not recommended until age 1, with the second given between ages 4 to 6. The virus is spread through the air after a person with measles coughs or sneezes. People with measles can spread the virus to others before they show symptoms. The virus can also linger in the air for minutes to hours after someone who is infectious has left. Those who've been fully vaccinated or who were born before 1957 are considered protected along with those who've already been infected. Oregon health officials said they know of no other cases of the measles. Monday, July 30, PDX Airport, 2:15 to 3:45 p.m.
Tuesday, July 31, Leno Medoyeff Bridal, 710 NW 23rd Ave., Portland, 3:30 to 5:30 p.m.
Wednesday, Aug. 1, Tom’s Pancake House, 12925 SW Canyon Road., Beaverton, 7 to 9:30 a.m.
Thursday, Aug. 2, Max Red Line, Beaverton Transit Center to Pioneer Square, 12:30 to 1 p.m.
Thursday, Aug. 2, Max Red Line, Pioneer Place to Beaverton Transit Center, 5:30 to 6 p.m.
Sunday, Aug. 5, Verde Cocina, 5515 SW Canyon Court, Portland, 2 to 4:30 p.m.
Health officials said there was no connection between this case and the one in June. If someone develops symptoms, they should call their health provider. Don't just show up at the provider's office because others could become infected, health officials said.